International Society for Krishna Consciousness in Bangalore is one of the famous tourist destinations in Bangalore. Sri Radha Krishna Temple is one of the largest ISKCON Temples in the World and is located 1.2 Kilometers away from Royal Opera. The Royal Opera serviced apartment, where in the spaces are designed for you. Be it the spacious rooms, the large size bed, the extra pillow mat as top on for the mattress, the spacious bathrooms or the various amenities and facilities. Royal opera is designed to ensure your stay is comfortable and relaxing after a long and tedious work day. One will appreciate the tasteful decor & modern amenities, backed with great ambiance and a value for money tariff. Its close proximity to the Yeshwantpur railway station is an added advantage for the traveller and its proximity to city centre makes it an ideal choice to stay. Royal opera offer 28 rooms in three categories to suit one’s needs. We have the studio room for single traveller who desire privacy. The deluxe room are meant for business traveller group and the large premier rooms are for guests who are looking for triple occupancy. 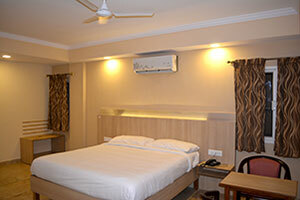 All the rooms are air conditioned and are provided with LED TV with satellite cable, running hot and cold water. Hot water kettle and free wifi connectivity.The roof top restaurant serves complimentary breakfast to its room guest and provides with lip smacking north Indian dishes for lunch and dinner. Session wise room service is also provided. Different types of facilities we provide you. Elegant rooms that are ideal for budget travelers and a frequent visitor to the city. The in-room facilities and amenities ensure guest needs are taken care. 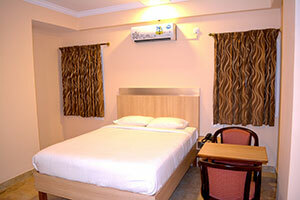 The rooms are appointed with facilities like Air Conditioner, Satellite LCD Television, Work desk, Wi-Fi and Phone. Deluxe Rooms are cozy, comfortable and exude the warmth that you would have in your own living space. These are ideal for business travellers. They are well equipped with Comfortable Queen size beds, Air Conditioner, Satellite LCD Television, Work desk, Phone, Wi-Fi, Tea/Coffee Maker, Complimentary Breakfast, Daily House keeping and Daily Newspaper. 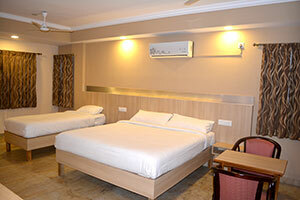 Premium rooms are ideal for family or triple occupancy. They are spacious and elegantly appointed with a King size bed and an additional single bed, Satellite LCD Television, Work desk, Phone, Wi-Fi, Tea/Coffee Maker, Wardrobes, Guest toiletries & amenities, Complimentary Breakfast, Daily house-keeping, Newspaper. Below are some of the features of our service apartments. Below are some of the Photographs of our facilities. You can use the following information to contact us.